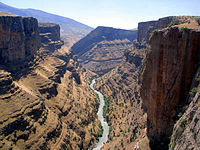 Upper Mesopotamia, and the Zagros Mountains, including parts of Eastern Anatolia Region (Armenian Highlands) and southeastern Anatolia, northern Syria, northern Iraq, and the northwestern Iranian Plateau. 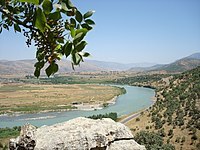 Zê river in Zebari region, Iraqi Kurdistan. 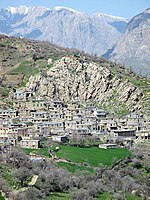 ↑ A rough estimate by the CIA Factbook has populations of 14.5 million in Turkey, 6 million in Iran, about 5 to 6 million in Iraq, and less than 2 million in Syria, which adds up to close to 28 million Kurds living in these countries (i.e. 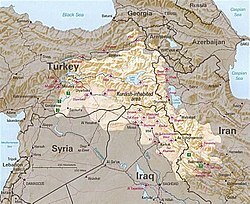 in Kurdistan proper and in other parts of the states comprising the area taken together). CIA Factbook estimates as of 2014; Turkey: "Kurdish 18% [of 81.6 million]", Iran: "Kurd 10% [of 80.8 million]", Iraq: "Kurdish 15%-20% [of 32.6 million]" Syria: "Kurds, Armenians, and other 9.7% [of 17.9 million]".